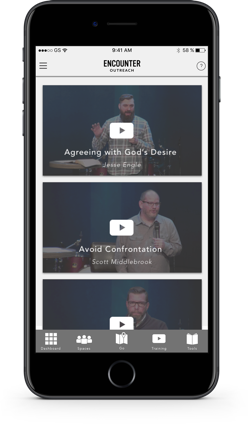 We are excited to announce a new version of our Encounter Outreach app for iPhone and Android devices. Using your feedback, our app management team has worked diligently to create a seamless user experience. 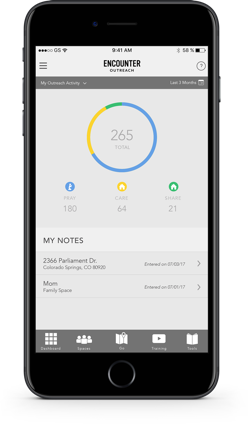 The updated app will provide more frequent updates, offer quicker access to more content and bring you better usability than before. Updated technology for easier navigation. Quick outreach tracking with a house activity pop-up that generates automatically at any home you select. More accurate mapping via Google Maps. 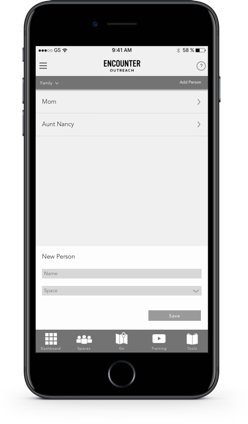 More flexibility to use the app immediately or find a group or groups to join. 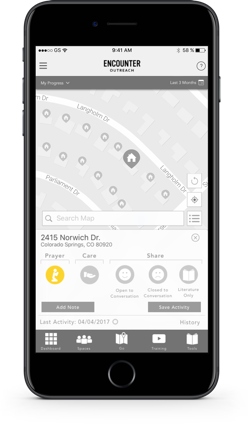 Track your progress of praying, caring and sharing the Good News with your neighbors and watch the interactive map change colors as you go. Track your progress of praying, caring and sharing the Good News with those in your circle of influence — those you live, work and play with. Access training videos that give you prayer and outreach tips to guide you as you encounter the unengaged. 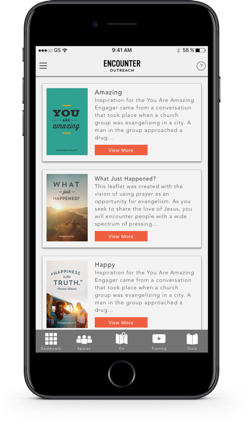 Order free Engagers, written tools designed to help you share the Good News in a culturally relevant way. Define your outreach vision and strategy. Electronically invite your congregation or home group to join your outreach. Track your group’s progress through electronic map updates (color coding) and view “reached” and “prayed for” outreach details. Schedule training and outreach events and notify your groups of the event details. Send updates and information to your group through the app. We hope you enjoy using the updated app! Check out the screenshots below for look at the new design and layout. Feel free to contact us at info@encounter.com with any feedback or questions. Track the progress of your Gospel Engagement activities. Engage those you live, work, and play with. Customize your own list of the people you are praying for and track the progress of your Gospel activity. Inspirational videos on how to effectively engage the unengaged with the Gospel. Review and order free Engagement tools designed to help you reach your friends, neighbors and coworkers with a culturally relevant message. A helpful dashboard to monitor your own Gospel Engagement activities as well as your groups outreach activities. You can now invite your friends to your groups! Let us know what you think of the app on the new feedback page. There is now a My Account page for updating your user settings and/or password. An all new app walkthrough has been added. A list of user notes are now accessible on the Dashboard. Users can now leave a group if desired. All new design and layout. Individuals now have the ability to track outreach without being in a group. New outreach activity with the ability track Praying, Caring, and Sharing with a home. New and quicker outreach activity tracking with an all new activity pop-up drawer. New filtering options for viewing your outreach progress. Users can now be in multiple groups and be able to assign outreach activity to the group of there choice. New Dashboard with outreach statistics.